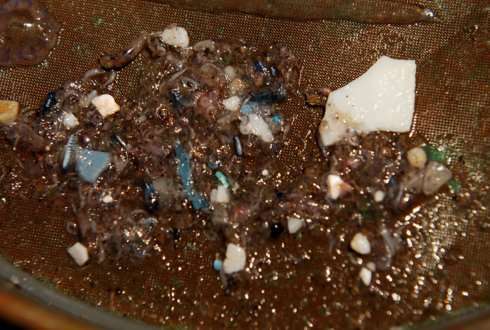 In May, PNAS published an article that describes how research developed from finding unexpectedly high numbers of plastic particles in the marine environment to developing methods for identification and to effect assessment studies aimed at defining effect thresholds. This news feature is based on interviews with a series of leading scientists in the field. After a lot of research, still remarkably little is known about how toxic this plastic may be for humans and animals, whereas to date no clear indications of ecological harm have been identified. Although microplastics are being found everywhere, a huge fraction seems to be 'lost', with nano-fragmentation, sinking to the deep see or ingestion by fish as speculated loss mechanisms. Plastic absorbs chemicals and bioaccumulates in organisms, whereas laboratory studies confirm that microplastic can carry toxic chemicals to organisms as long as the organism is clean. However, pollutants and other chemicals are already present in the marine environment, and it is hard to say how much additional uptake and harm a small fraction of microplastics might cause. Recent modeling studies by Bart Koelmans from IMARES and Wageningen University showed that uptake of toxic chemicals from microplastic probably is of minor importance under truly realistic environmental conditions where uptake from natural path overwhelms uptake from the microplastic. These mechanisms however are complex and sometimes counterintuitive, whereas another question: that of nanoplastic toxicity still is fully open. Therefore, researchers ultimately agree that there are still too many unknowns to fully assess the environmental damage caused by microplastic.